OWN loves Love Is ____. Today, the network announced they’ve renewed the TV show for a second season. From Mara Brock Akil and Salim Akil, the romantic drama explores how a modern “power couple” balances their professional, personal, and family lives. The cast includes Michele Weaver, Will Catlett, Idara Victor, Tyrone Brown, Kadeem Hardison, Yootha Wong-Loi-Sing, and Lana Young. The season one finale of Love Is ____ premieres on OWN on August 21st at 10 p.m. ET/PT. 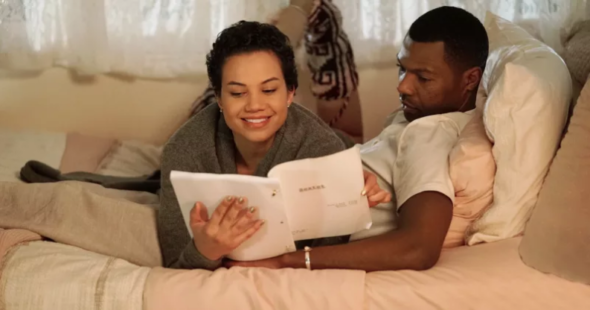 Los Angeles – OWN: Oprah Winfrey Network announced today it has renewed for a second season its hit romantic drama series “Love Is___” from award-winning producers Mara Brock Akil (“Being Mary Jane,” “The Game,” “Girlfriends”) and Salim Akil (“Black Lightning”). The Akils created and executive produced the series through their company Akil Productions, in association with Warner Horizon Scripted Television. Brock Akil serves as the series’ showrunner, as well as director for the pilot and upcoming season finale episode (Tuesday, August 21 at 10 p.m. ET/PT). “Love Is___” (Tuesdays at 10 p.m. ET/PT) premiered June 19 with 1.2 million viewers and a 1.2 W25-54 rating (L+3) and was the night’s #2 telecast on all of television among African American women. The July 17 telecast achieved a series high across all key demos and total viewers with 1.4 million viewers and a 1.51 W25-54 rating. On average over its series run, “Love Is___” ranks as the #1 show on cable in its time period with W25-54. Set primarily in 1990’s Los Angeles against the backdrop of Black Hollywood, “Love Is___” follows Nuri (Michele Weaver) and Yasir (Will Catlett), a couple from seemingly opposite worlds, as they chase their dreams and learn to follow their hearts. Told from the perspective of the couple’s present-day selves, the romantic drama also revisits the social issues and vibrant black culture of that time reflecting on how it all aligned to shape the couple they have become nearly 20 years later — a power couple navigating a complex set of social codes while also balancing successful careers and a beautiful family. Drawing inspiration from creators Mara Brock Akil and Salim Akil’s own relationship journey, the series explores the highs, the lows, and the magic of falling (and staying) in love. The cast includes series regulars Michele Weaver (“Illicit”) as ‘Nuri,’ a bubbly personality with big dreams who is struggling to make a name for herself as a sitcom staff writer while juggling an assortment of romances that only leave her partly fulfilled; Will Catlett (“Black Lightning”) as ‘Yasir,’ an aspiring writer/director who is down to his last two unemployment checks and lives (unhappily) with his on-and-off again ex ‘Ruby,’ played by Yootha Wong-Loi-Sing (“Alles Voor Elkaar”). Tyrone Marshall Brown (“Bull”) portrays ‘Sean,’ Yasir’s opinionated friend who possesses great taste and is full of ideas but lacks follow through; and Idara Victor (“Mad Men”) stars as ‘Angela,’ a member of the same writing staff with Nuri who doesn’t always agree with everything Nuri says, mainly because she is a disgruntled drama writer stuck in a comedy she doesn’t believe in. TV veteran Kadeem Hardison (“A Different World”) is ‘Norman,’ the executive producer of the hit sit-com “Marvin” and tough boss of Nuri and Angela who is hard to impress and even harder to amuse; Clarke Peters (“The Wire”) portrays present day ‘Wiser Yasir,’ handsome, still-confident and Nuri’s husband of many years; and Wendy Davis (“Army Wives”) is ‘Wiser Nuri,’ who is a more relaxed, happy, and comfortable version of herself both in life and in her marriage to Yasir. What do you think? Have you seen Love Is ____? Are you glad it’s coming back? I Love, Love is and I’m a man who was just watching it because of my Lady who love romantic movie’s and also to keep her happy.but eventually also love it just as much as her and could not be more ecstatic about it’s return thank you so much O.W.N. need this in my Life. Please bring back Love is___ i love the realness of the couples life! Their need to be more series of shows like Love is. I found the story encouraging, real, humorous, inspiring and motivating. Please bring back “Love Is__”!!!! I’m so looking forward to continuing with this love story. A relationship story that we can really relate to. Tell Oprah to renew Love Is for a third season in 2019! I loved this show!! Please! I am so glad Love Is has been renewed. I have been anxiously waiting to hear. Watching the show gives me hope that true love, thru all kinds of obstacles, can be had! The chemistry of the actors who play Nuri and Yasir is so tangible and real. Can’t wait for Season 2. Yes Yes love this show touch my heart I have been married 19 years I want that kind of love. It truly inspires me. I love Love Is …. My Tuesday nights were spent watching it. Great scripts. So many episodes touch my heart. Waiting patiently for Season 2. You should get this show back on the air ASAP! One of the best written shows ever. Continued success!